The procedure to regain hair growth for facial hair. Just like your choice in hairstyle, facial hair is an important part of your image. Some men cannot grow facial hair, or have patchy beards. There are no medications, creams, or ointments that grow facial hair. The only true option to regain growth is facial hair transplant. You have your own style or image of how you want to look. Just like the choice in your hairstyle, facial hair is an important part of your image. Unfortunately, facial hair is a genetic trait that you have no control over. Some men cannot grow facial hair. Others have patchy beards. Some cannot connect their goatee. Even sideburn growth is a genetic trait that can limit your ability to achieve your desired look. There are no medications, creams, or ointments that grow facial hair. The only true option is to get a facial hair transplant. This NHI Medical patient underwent a beard transplant. Facial hair transplant surgery, which includes implanting hairs to the sideburns, mustache, or cheeks, works by harvesting the donor hair from the back of your scalp. In some cases, you can harvest the donor hairs from under your chin. The premise of a hair transplant or facial hair transplant surgery is relocating hairs from an abundant area, which is usually the back of your head, to the area where you want more hair. The donor hairs that are removed do not grow back in that same spot. Instead, they grow in the newly transplanted location (such as the cheeks, goatee, sideburns, mustache, etc). Is a beard transplant worth it? If you always wanted to have a beard or a 5 o’clock shadow, beard hair transplant surgery is a great option. Just like your hairstyle, having facial hair or a full beard can completely change your look. Some men want to have patches of their beard filled in. Some want a neatly trimmed goatee or stylish sideburns. As insignificant as it may seem to others, an artistic beard transplant is worth it to many men. How do you harvest the donor hair for facial hair? 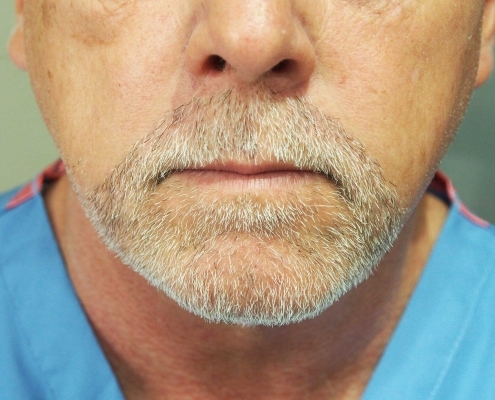 Facial hair transplants can create or replace facial hair that is sparse, thinning, or missing. The transplanted facial hair is harvested from the scalp or body using one of two harvesting methods, Follicular Unit Transplantation (FUT) or Follicular Unit Excision (FUE), depending on your hair characteristics and density. Follicular Unit Transplantation (FUT) is also known as Follicular Unit Strip Surgery (FUSS), or “Strip” harvesting. The main difference between FUT and FUE are the type of scars they leave behind on the back of your head. FUT leaves a linear scar while FUE leaves thousands of dot scars. If you wear your hair very short in the back, the FUE harvesting is the best option for you. There are different trade-offs or pros and cons associated with each type of harvesting method. [yesicon]Post-operative pain is less than FUT. [yesicon]You can wear your hair very short without worrying about a scar showing. [yesicon]Healing time in the donor area can be less than FUT (but not always). [noicon]Moth-eaten, patchy, thin look to the back of your head when your hair is very short (thousands of dot scars). [noicon]Slightly less growth rate compared to FUT (strip) due to transection. [noicon]Less total lifetime yield compared to FUT (strip). [noicon]Have to shave the back and sides of your head for surgery. [noicon]Usually costs more than FUT (strip). [yesicon]Better growth rate than FUE. [yesicon]Less transection or damage of hair follicles due to precise stereo-microscopic dissection. [yesicon]You do not have to shave your head for the procedure. [yesicon]Usually costs less than FUE. [noicon]Cannot keep the back of your hair very short (#2 or #3 guard or fade with your razor is fine, but you will see a scar with a #1 guard). [noicon]Post-operative pain at night may be worse with FUT as compared to FUE (Pain is subjective and is experienced differently for many patients). How do you implant the hair to the face? The implantation of each and every hair follicle to your face to create a natural looking sideburn, beard, mustache, or goatee is what counts. You are choosing a doctor at NHI Medical to give you the best results. Your doctor will artistically plan each location of individual hair follicles. Among many variables, the doctor is responsible for the correct angle, direction, and distribution of your hair follicles to create the most natural look. A great facial hair transplant will never be detected by others. Once the doctor creates the tiny incisions where your hair grafts will go, our highly trained surgical staff will meticulously insert each hair follicle. NHI Medical’s staff has over 10 years of facial hair implantation experience, and they are often an overlooked component of making your surgery a success. Can you take hairs from my back, chest, or other parts of my body? Donor hair can come from anywhere on your body. However, the hair quality and growth cycle of your chest or back hair do not match with your facial hair. In some cases, NHI Medical doctors will use the extra hairs on the underside of your chin or neck area that match with the hairs on your face. However, in most cases, this is not enough. The best quality donor hair comes from the back of the scalp because it closely matches the hair on the face in its texture and growth cycle. How many hairs will I need for my beard? 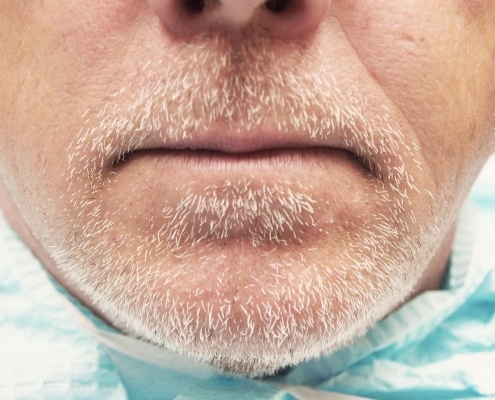 Your facial hair transplant is not all about the numbers, or “how many grafts” you need. Your results will depend on the color, quality, length, and texture of your donor hair. For example, black hair on pale skin will make your facial hair look very thin compared to having blonde hair on pale skin. Curly, coarse hair also makes for a fuller facial hair appearance. If you have very fine hair, it will result in a fine, thin facial hair appearance. Of course, keeping your facial hair longer will give you the look of fullness. Each patient is unique in their goals and needs. Assuming an average person with brown hair and medium-toned skin and with medium-textured hair, we have provided rough estimates of how many grafts one may need. Can I accomplish my goals in one surgery for a beard transplant? One surgery is always the goal. However, your goals may exceed what is realistically possible. It is important to discuss your goals and expectations with your doctor. As mentioned above, your skin and hair characteristics as well as how long you keep your facial hair will also play a role. What are the potential risks and side effects of a beard transplant? A beard transplant is a safe outpatient surgical procedure without significant risks or complications. After your procedure, you may experience some redness, soreness or numbness. Your physician will prescribe medication(s) to help manage any discomfort. When can I go back to work or be seen in the public after a beard transplant? Most patients go back to work a few days after their beard transplant surgery. Your face or the area where the hair grafts were implanted will look slightly red for the first few days. It is rare for the redness to persist for more than a week. If you have pale or sensitive skin, the redness may persist longer than a week. By the first week, most of the redness is gone and the transplanted hairs will blend in and look like stubbles of hair. When will I see the results after my beard transplant? Facial hair growth varies in each individual. A small number of our patients will see the hair grow immediately, but the vast majority will see some growth four to six months after surgery since the hair has to grow from the roots. Complete results are evaluated and observed after 12 months. How do I take care of my beard transplants? The day after your beard transplant surgery, we offer complimentary washing of the donor and transplanted area. We will teach you the nuances of the day to day care after surgery. We will provide you with all post-operative care instructions to help aid in your recovery after your beard transplant surgery. You will also have your doctor’s personal mobile phone number so you can contact them during off hours. How quickly will my beard transplant hairs grow? The transplanted hair will grow like your regular scalp hair, so you will need to trim your facial hair to your desired length as you see fit.